McMillan Sand Filtration Site, Washington, D.C.
Are you looking for something off the tourist track? What about something that at first sight makes little sense? Then the McMillan Sand Filtration Site is for you! Unfortunately, it is closed to visitors but you can the site is bounded by (and you can get good views of it from) North Capitol Street, Channing Street NW, 1st Street NW, and Michigan Avenue NW. Today, one can glimpse the two paved courts that are lined by regulator houses, tower-like sand bins, sand washers and the gated entrances to the underground filter cells. 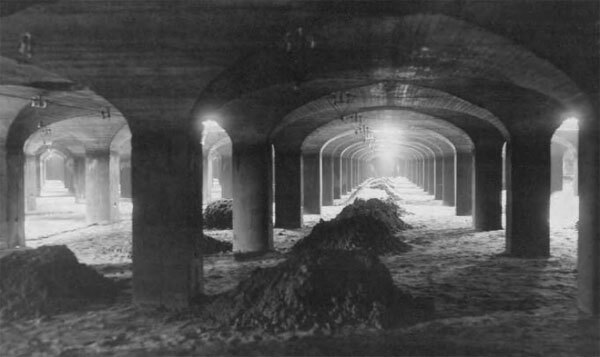 Below grade at the twenty-five acre site, there are twenty catacomb-like cells, each an acre in extent, where sand was used to filter water from the Potomac River by way of the Washington Aqueduct. 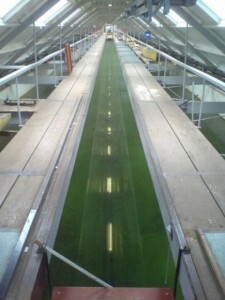 The treatment was a slow sand filter – a biological treatment system that provided a slow, steady flow of clean water. For large-scale municipal purposes, the slow sand filter is inefficient and it was replaced in 1985 with a rapid sand filter (which is located across First Street at the McMillan Reservoir. Diagram of the Washington City Tunnel by the US Army Corps of Engineers. Before water can be purified, it must get to the McMillan complex and it has always arrived the same way, via the Washington Aqueduct. The aqueduct was commissioned by Congress in 1852 and construction began in 1853 under the auspices of the US Army Corps of Engineers (who still own and operate the system). 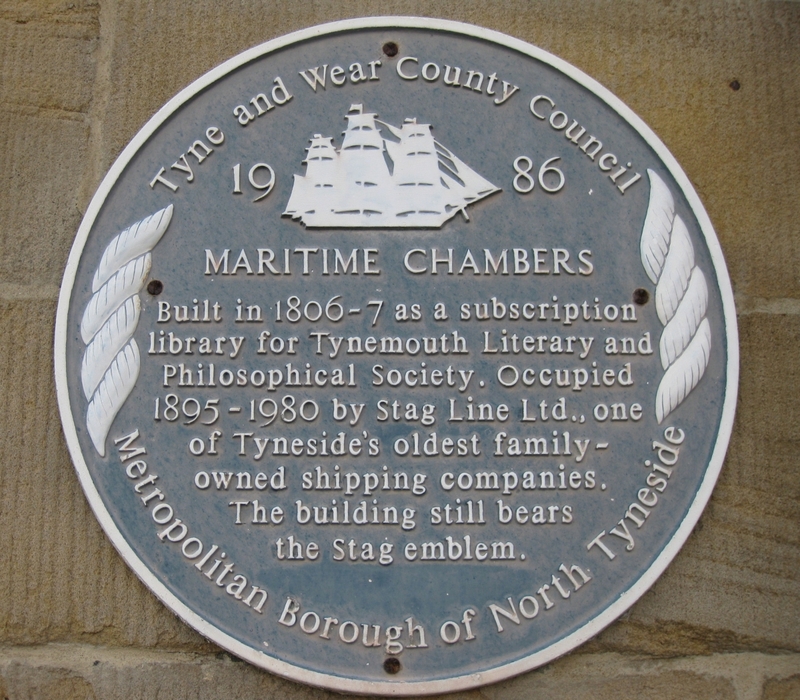 It gradually opened starting on 3 January 1859, was fully open in 1864, and has been in continuous use since. Water travels through the pipeline from Great Falls to the Dalecarlia Reservoir, and then to the Georgetown Reservoir. 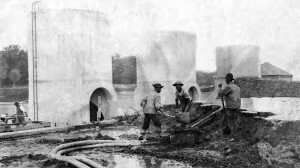 From Georgetown, the water leaves via the “castle” on McArthur Boulevard NW, through an arrow-straight tunnel to the pumping house on 4th Street at the McMillan Reservoir. The aqueduct is listed as a National Historic Landmark, and the Union Arch Bridge within the system is listed as a Historic Civil Engineering Landmark. McMillan sand filtration site under construction. Photo by the US Army Corps of Engineers. The McMillan reservoir, which still holds untreated water for D.C., opened in 1902 and is a dammed stream valley. The water that flowed through the valley became Tiber Creek and flowed into the Potomac following what is now Constitution Avenue. To clean the water before it was distributed to residents, a filtering plant also had to be constructed as part of the McMillan complex. 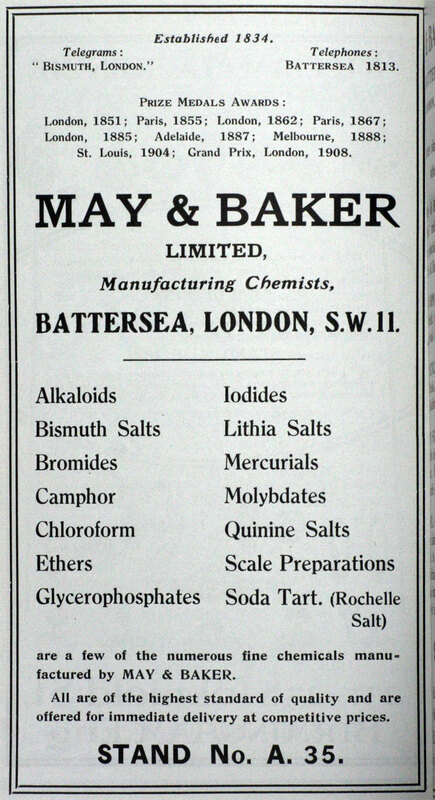 At the turn of the 20th century, there was a debate regarding the best practice to purify water – chemical (e.g. chlorine) versus biological (e.g. slow sand). In D.C., slow sand filtration won out and Congress provided the Army Corp of Engineers with money to build the McMillan Sand Filtration Site. Photo of Sand Pit being filled with sand. Photo from the US Army Corps of Engineers. Sand filtration is pretty simple. Dirty water enters the pit, which contains a two-foot layer of sand, percolates through the sand and is clean when it reaches the bottom, where it is drawn off by a pipe. While the operation of the filter is simple, the process by which it cleans the water is not. A slow sand filter works because of the formation of a gelatinous layer called the hypogeal layer or Schmutzdecke in the top few millimetres of the fine sand layer. It forms in the first couple weeks of operation and consists of bacteria, fungi, protozoa, rotifera, and aquatic insect larvae. As the Schmutzdecke ages, more algae develops and larger aquatic organisms appear, including bryozoa, snails and Annelid worms. The Schmutzdecke provides effective purification in potable water treatment, while the underlying sand provides a support medium for this biological treatment layer. The water produced from a well-managed slow sand filter can be of exceptionally good quality with 90-99% bacterial reduction. Slow sand filters slowly lose their throughput volume as the Schmutzdecke grows, and it necessary to refurbish the filter to maintain volume (which means removing/disturbing the Schmutzdecke and allowing it to regrow). The overgrown Clean Sand Silos. 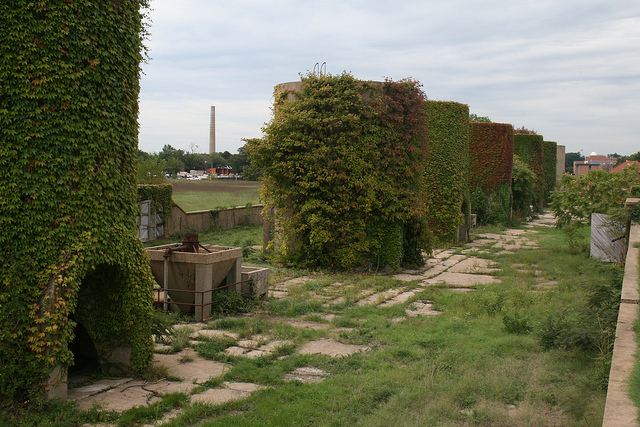 Today, the most visible sign of the site’s history are the overgrown clean sand silos and regulator houses. The rest of the site is covered in grass, as it was when it was designated the McMillan Reservoir Park in 1906 by Secretary of War William Howard Taft. It was a memorial to to Senator James McMillan (R-Michigan) for his work as chairman of the Senate Commission on the Improvement of the Park System and his efforts in shaping the development of the city of Washington at turn of the century (aka the McMillan Plan). After Taft became President, the site was officially designated a park by Congress in 1911. Originally conceived as part of the “necklace of emeralds” that would ring the city in permanent open green space and restore much of L’Enfant’s original city plans. In total, the forward-looking plans made by the McMillan Commission called for: re-landscaping the ceremonial core, consisting of the Capitol Grounds and Mall, including new extensions west and south of the Washington Monument; consolidating city railways and alleviating at-grade crossings; clearing slums; designing a coordinated municipal office complex in the triangle formed by Pennsylvanian Avenue, 15th Street, and the Mall, and establishing a comprehensive recreation and park system that would preserve the ring of Civil War fortifications around the city. The implementation of the McMillan Plan involved the leading civil engineers, urban planners, artists, architects, and designers of the time and at the Reservoir alone, landscape architect Frederick Law Olmsted, Jr., engineer Allen Hazen, sculptor Herbert Adams and architect Charles Platt were involved. While the engineering work was paid for by the Army Corps, the landscaping work was paid for by the family of Senator McMillan. Regulator houses such as this one contained valves for controlling the flow of water through each cell. While it was a functional piece of real estate because of the sand filter, it was topped by “an imaginative combination of landscaped park … personally supervised by Olmsted.” In a racially segregated D.C., the park was open to all and residents from the ethnically diverse local neighborhoods were delighted to use the park’s amenities. Courting couples promenaded, families picnicked, and boy played ball games on top of the vaults full of white sand. 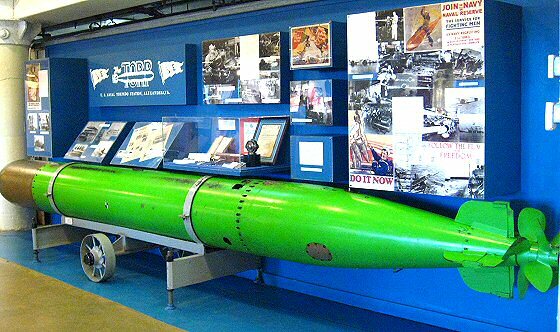 Unfortunately, because of security concerns about the safety of Washington’s water supply, the site was closed to the public during World War 2, when a fence was erected around the site; today, it is only open to special visitors and on specially arranged biannual tours. From its’ completion in 1905 until the Army Corps sold the Sand Filtration Site in 1987, the site was protected from development. In 1986, the Army Corp declared the land as surplus and the General Services Administration arranged to sale it. 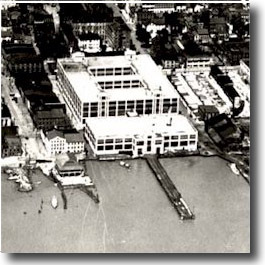 The The District of Columbia government purchased the site in 1987 for $9.3M, in order to facilitate development. 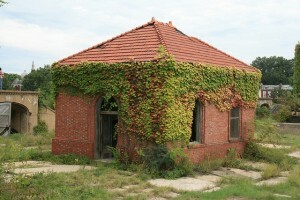 Since the time of purchase, the property has been vacant and has deteriorated severely due to lack of maintenance. Today, the McMillan Park Committee is fighting to maintain it openness and historic character, while the D.C. government is considering site for dense commercial and residential development. 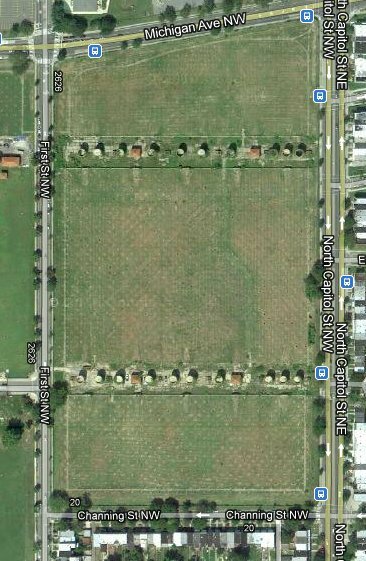 The following video provides an overview of the planning arguments surrounding the site and some great historic images of the area. 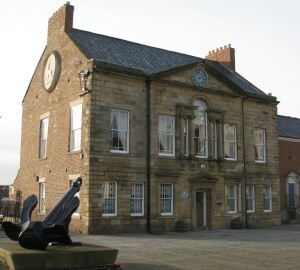 Main entrance to Finch Foundry, by Graham Tait. Image licensed under Creative Commons Attribution-NonCommercial-ShareAlike 2.0 license. 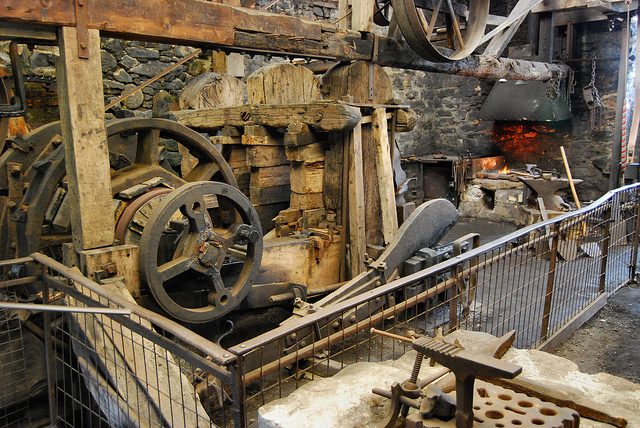 In the small hamlet of Sticklepath, on the northern edge of Dartmoor, the National Trust in combination with the Finch Foundry Trust have restored a nineteenth century working edge tool manufactory – not strictly speaking a foundry despite its name. 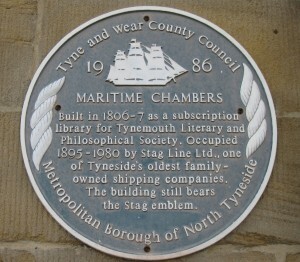 It was started by William Finch in 1814. The name Finch is one of four surnames, which Samuel Smiles states were traditionally associated with iron working. Three overshot water wheels provide the power for a tilt hammer, a drop hammer and a shear hammer. In 1958 a water turbine was installed and a Hydram provides a better head of water but the business closed in 1960. Since everything is kept in working order, it is possible to see the equipment being used by a blacksmith. Smiths have shaped wrought iron with hand held hammers for millenia. Water powered hammers are recorded from China in 20 AD but they only became common in Europe in the 12th century. 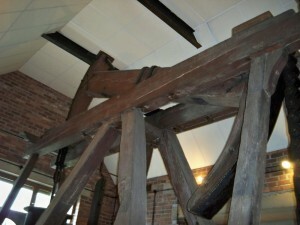 Water powered stamp mills were used to break up mineral ores. Massive hammers raised by water power and then allowed to drop under gravity were used to turn blooms into more workable bar iron and particularly for fabricating articles from wrought iron, steel and other metals. In such metal works, multiple hammers were powered via a set of line shafts, pulleys and belts from a centrally located water supply. However during the Industrial Revolution the trip hammer generally fell out of favour and was gradually replaced with power hammers worked by steam, and more recently by compressed air. Finch Foundry interior, by aldisley. Image licensed under Creative Commons Attribution-NonCommercial-NoDerivs 2.0 license. Water powers the bellows for the forge and all the machinery, including the lethal-looking automatic shears. Traditionally iron workers have always celebrated on St Clement’s Day. There are still remnants of this tradition in the early iron working districts in the weald of Sussex and Kent. More recently it smiths from all over Britain have come to Sticklepath every 23rd November in order to demonstrate their skills and hold a competition to make decorative ironware – and this is open to the public. Sticklepath was a hamlet of water mills. 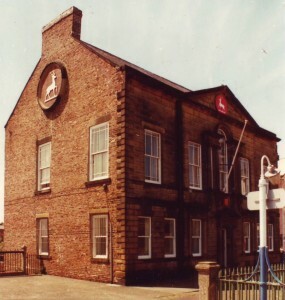 In 1814 William Finch leased Manor Mills, which had previously been a corn mill and gradually built up his business. Since he was born at nearby Spreyton, it is thought he may have gained his practical experience at the Tavistock Iron Works. Initially he installed a pair of tilt hammers, possibly purchased from them. Later he added power shears and an air blast sufficient to work half a dozen blacksmith’s hearths plus two furnaces, all powered by water. The business became known as The Foundary – but in practice it was a forge employing seven or eight blacksmiths producing up to 400 agricultural or mining tools a day. Tools with a sharp edge needed to be ground on the water powered grindstone but the workmen found that half a day spent sharpening them was enough for any man, so apprentices were often sentenced to ‘put their nose to the grindstone’ for misbehaviour. 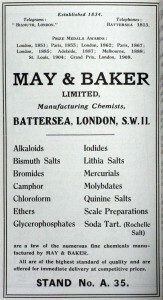 Their travelling salesmen followed a regular circuit around the mining and china clay industries throughout the west of England and also visited agricultural merchants and ironmongers en route. To the rear of the main building is a store for the straw and reeds used for packing the tools prior to transportation. The Finch family business interests extended into corn milling, carpentry, wheel wrighting and since they puchased coal and coke in bulk – the sale of domestic fuel. 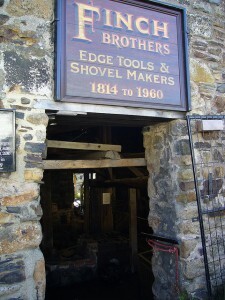 The business only closed its doors in 1960 and many of their account books, catalogues and samples of their hooks, scythes, hay knives, forks and hoes are on display. Directions: The Foundry is in the middle of Sticklepath just off the A30 east of Okehampton, Devon. If you ring them in advance they may be able to tell you when a blacksmith will be working there. A flash photograph of the Man engine at Dolcoath Mine, Cornwall, 1893. Image available in the Public Domain and licensed via Wikimedia Commons. Despite being at one far-flung corner of the British Isles, in the eighteenth century the county of Cornwall found itself at the centre (or at least at one centre) of processes that would irrevocably alter British life and Britain’s landscapes: industrialisation. The mining of tin and copper had been undertaken in Cornwall as far back as the Bronze Age, although the practice remained largely unchanged up to the eighteenth century. However, the introduction of the use of gunpowder in the 1690s helped with the sinking of shafts and the driving of levels. 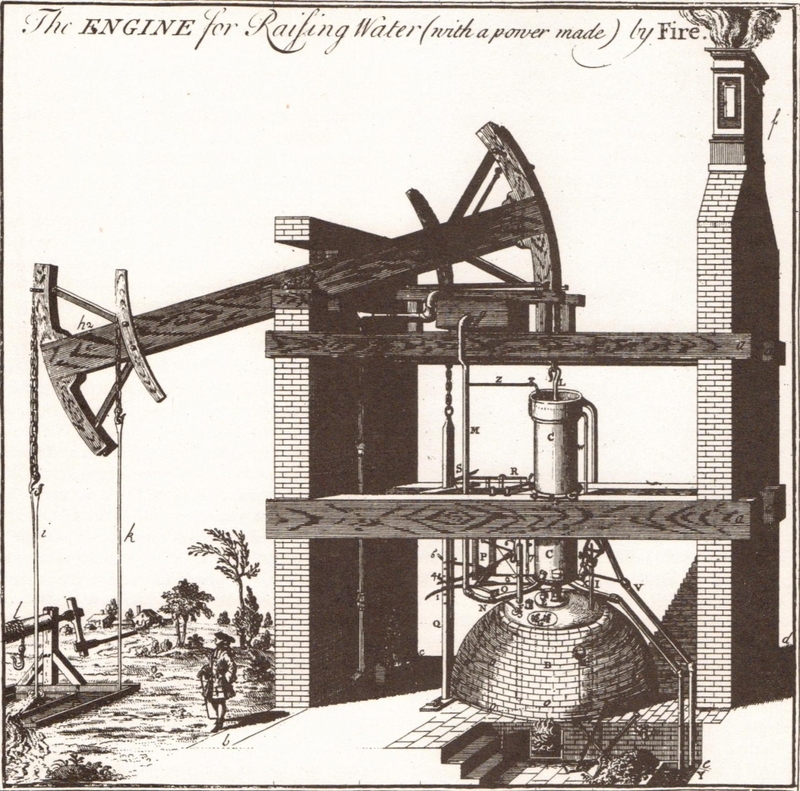 Thomas Newcomen’s ‘fire engine’ promised to assist in the problem of flooding in the 1710s but the cost of running the engine proved so prohibitive that by 1740 there were only three of his steam pumps at work in the county. 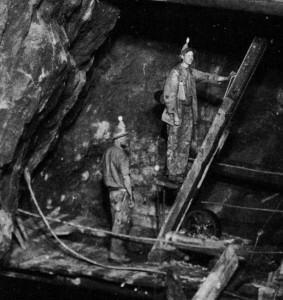 Improvements were made to the draining of mines using longer and more efficient adits, which were near-horizontal tunnels that allowed water to drain out of the mine by gravity. The situation was improved further in 1777 when James Watt came to Cornwall to supervise the erection of one of his engines at Ting Tang mine in Gwennap, near Redruth. 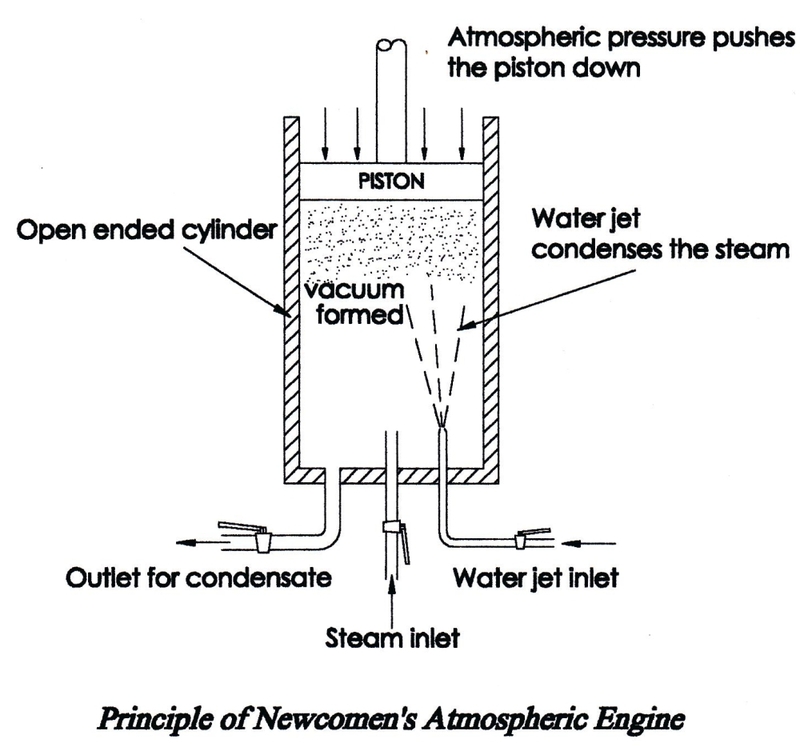 His engines incorporated a separate condenser and easily drained the water that two of the older engines had failed to do and used a quarter of the fuel in the process. This lowered the cost of extracting the copper and helped Cornish miners to compete with cheap Welsh ore. Further advances were made in the construction of these engines by the likes of Jonathan Hornblower and Richard Trevithick. 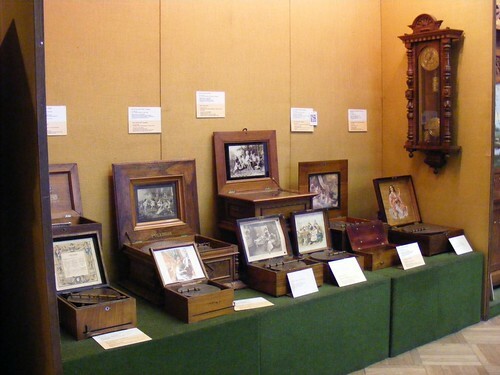 By 1800 Watt’s patent came to an end and with it the burden of royalties and restrictions on innovation. Trevithick built his high-pressure engine and enabled Cornwall’s mines to sink to extraordinary depths and helped the county to become the biggest copper producing region in the world. The demand for tin-plate in the British domestic market in 1800 also fed a tin boom in the nineteenth century, and served as a ready alternative when copper deposits began to run out by mid-century. 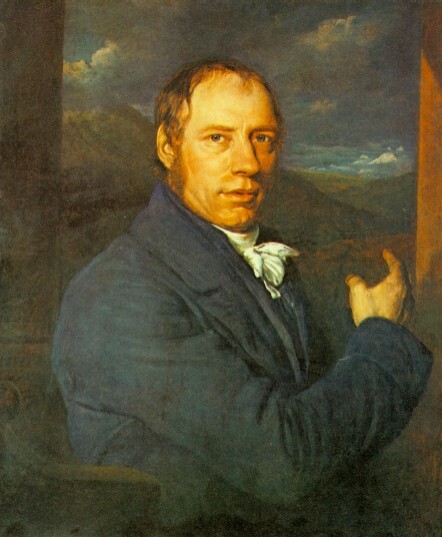 Painting of Richard Trevithick, the engineer, by John Linnell (1792-1882), 1816. Image available in the Public Domain and licensed via Wikimedia Commons. The impacts of mining were wide-ranging and felt by all in the county in some way. The population of Cornwall almost doubled, while towns expanded and ports became crowded with ships with orders from around the world. A local manufacturing industry developed in line with the enormous increase in demand for engines and machinery, which led to the establishment of major iron foundries near the mining centres, such as Harvey’s of Hayle and the Perran Foundry at Perranarworthal, near Truro. Transport and communications improved beyond recognition. The profits that could be made from mining in Cornwall in the eighteenth and nineteenth centuries generated vast new wealth for entrepreneurs and added to that of the old landed families. There were also numerous examples of more modest Cornish families who made their fortune through mining and ancillary industries. While the industrial revolution generated vast wealth for a few, it brought misery to many. With an abundant supply of labour, wages for those employed in mining and industry were pitifully low. Families had to work long hours in almost insufferable conditions when they were malnourished and permanently exposed to disease, polluted environments and hazardous conditions. Unsurprisingly, the gentry lived in constant fear of insurrection as violent protests against living conditions and the price of food were routine. In between the very rich and the very poor, industrialisation helped to create a burgeoning middle class in Cornwall, whose professions were supported, either directly or indirectly, by the influx of capital into the county. It was this eclectic socio-economic group that helped to reshape a Cornish identity rooted in urban industrial prowess, which was added to a longer-held rural identity based on the landed gentry. Cornwall’s mining and manufacturing industries played a large part in the establishment of scientific societies in the county. The Royal Geological Society of Cornwall, formed in Penzance in 1814, was in fact only the second geological society to be established in Britain, after the Geological Society of London. It was a socially elitist society and many of its leading members were connected to mining, either as landowners or industrialists. The Society opened the first scientific museum in the county, which displayed its impressive collection of minerals, both local and foreign. 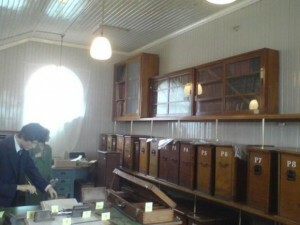 Cornwall’s second scientific society, the Royal Institution of Cornwall, also invested heavily in the sciences related to mining. It housed Philip Rashleigh’s remarkable collection of minerals, and still does today. The museum is on River Street in Truro. The Institution also developed an educational programme for miners and mining engineers. In 1888 the Camborne School of Mines was established and acted as an important training centre for the region’s miners, although by then Cornwall’s supplies of copper and tin were in decline and many Cornish miners were leaving the county to seek their fortune overseas. The decline and the exodus continued into the twentieth century and was complete by the end of the century. South Crofty was the last Cornish metalliferous mine to close, in March 1998. Cornwall was devastated by the collapse of the industry, both socially and economically. However, its fortunes have improved recently with the Cornwall and West Devon Mining Landscape being granted UNESCO World Heritage status in 2006. Philip Payton, Cornwall: A History, Fowey, Cornwall Editions, 2004. John Rowe, Cornwall in the Age of the Industrial Revolution, St Austell, Cornish Hillside Publications, 1993. 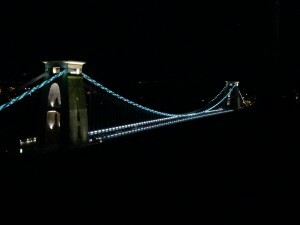 Clifton Suspension Bridge at night, by Al Howat. Image licensed under Creative Commons Attribution-NoDerivs 2.0 Generic license. The Clifton Suspension Bridge, spanning the picturesque Avon Gorge, is for many the symbol of the City of Bristol. 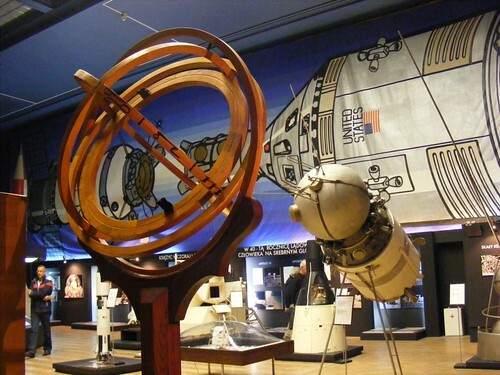 It is, also, a site for the celebration of not only Victorian science, but also more contemporary innovations. 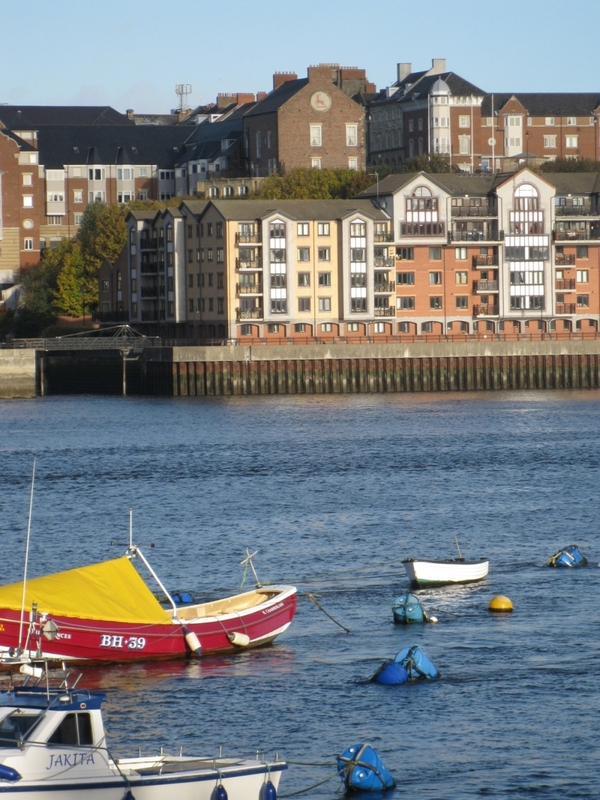 Its story begins in 1754 with the vision of a Bristol wine merchant who left a legacy to build a bridge over the Gorge. The twenty-four year old Isambard Kingdom Brunel was appointed project engineer – his first major commission. 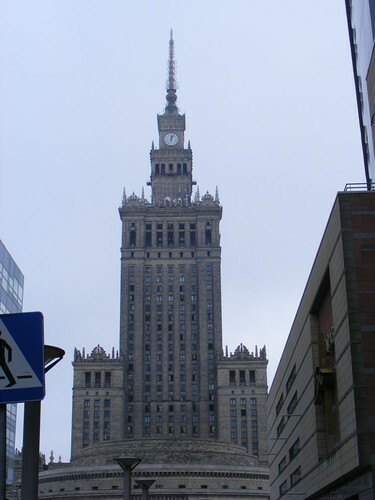 Work began in 1831 but the project was blighted by political and financial difficulties and by 1843, with only the towers completed, the project was abandoned. The Bridge was, however, completed in 1864 at a cost approaching £100,000 in memorial of Brunel who had died five years previously. 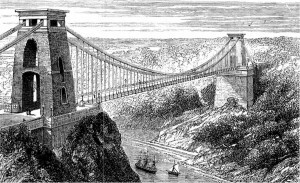 Illustration of Clifton Suspension Bridge. 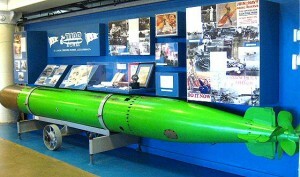 Image in Public Domain. Well, that is one version of the story. Adrian Vaughan, railway historian and biographer of the engineer, claims in his recent book The Intemperate Engineer, that Brunel’s idolatry is not justified – it is shorthand, convenient history. Vaughan argues that Brunel’s reputation today stems from ‘heroic myths’ promoted in a biography from the 1950s by Lionel Thomas Caswell Rolt which glossed over not only the engineers shortcomings, but also the contribution of others. Vaughan’s analysis of Brunel’s diaries and letters at the National Archives, Kew, and at Bristol University, show that the eventual bridge design was fundamentally different from Brunel’s and was the work of William Barlow and Sir John Hawkshaw. While Brunel’s design had two suspension chains supporting it, the final design had three, with a third more ‘hangers’ – the bard from the chains down to the road. It also had an entirely different system of attaching the ‘hangers’ to the chains, to correct the twisting effect that Brunel’s system would have had on the chains. The method of stiffening under the road was also entirely new. While Brunel had designed a system of wooden struts, these were not considered sufficient so were replaced with riveted, wrought iron, lattice work girders. We can, however, more readily identify the workings of a more contemporary addition to the Bridge. A question for you: how many light bulbs do you think it takes to illuminate this magnificent structure at night? None. The illumination system – which was switched on at a ceremony in 2006 to mark the 200th birthday of Brunel – is comprised of four elements. Along the length of the chains from which the bridge is suspended are more than 3,000 one watt LEDs (light emitting diodes), in groups of three, each focused on a small section of the chain and throwing into relief the giant nuts which connect the links; Fluorescent tubes beneath the handrail illuminate the walkway and silhouette and emphasize the delicate design of the iron lattice running the length of the bridge; lamps concealed within the arches of the two piers at each end of the bridge, and in the spaces around the top, reinforce the three-dimensional aspects of the bridge. The two sides of each pier are washed with light, carefully directed and focused to avoid the problems associated with urban glow. Low powered lights concealed beneath each end of the Bridge deck gently downlight the abutments so that, when viewed from the north or south, the Bridge no longer appears to ‘float’ above the Avon Gorge but can be seen to be connected to the structures which support it. The illumination system normally uses no more electricity than a detached house with its domestic appliances switched on.